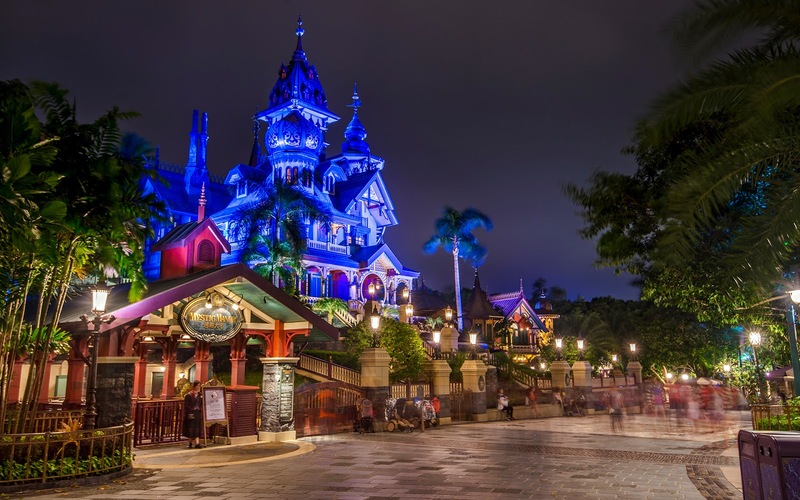 The angle seems familiar, and the sense of supernatural pervades as well, but in Hong Kong Disneyland, this scene isn't caused by the Haunted Mansion, but rather by Mystic Manor, an incredible dark ride that takes guests on a literal whirlwind journey, chasing after Albert the Monkey has he brings to life the artifacts of the house after opening an enchanted music box. On the outside, the nighttime scene definitely creates a sense of mystery, and the atmosphere takes on a bit of a fun and spooky time. Mystic Manor looms mysteriously at night.